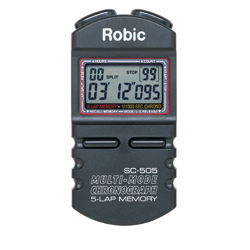 The Model 00040 Robic Stopwatch features single event timing, interval (LAP) chronograph, or accumulated (SPLIT) chronograph functions. It can time events in any mode up to 24 hours with 1/1000 second resolution. It also automatically counts up to 99 lap or split reads and has a memory recall of the last 5 readings. Auto lap / split release.